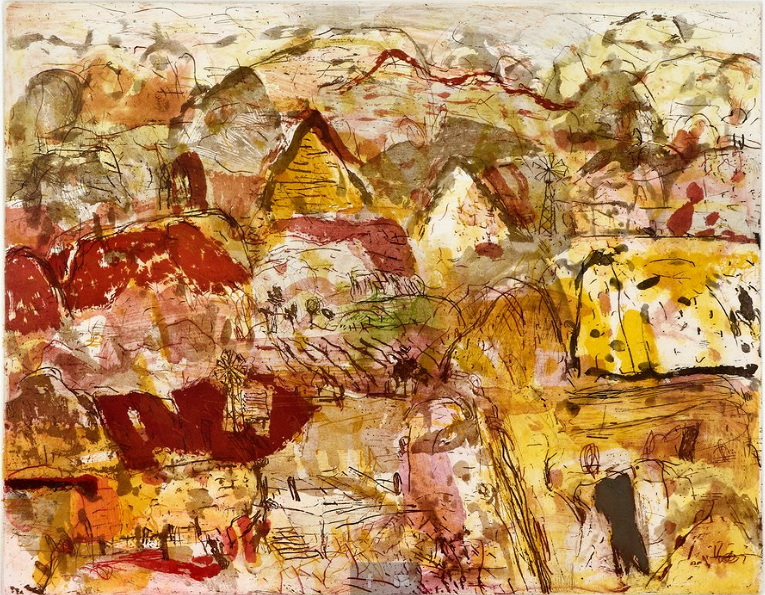 I recently went to the Cicada Press studios at COFA to talk with Elisabeth Cummings, an Australian artist who works predominantly in painting, but who also has a bit of a history with etching. Well, more than a bit. Elisabeth is currently working on several prints with Cicada Press Director, Michael Kempson, and the students of the Custom Printmaking class. The following is based on an interview given at the studio in Paddington. 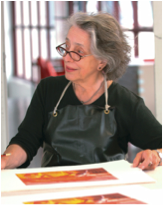 Elisabeth first worked on etchings with Michael Kempson at Meadowbank TAFE several years ago. Prior to this, she had made prints at art school, and again some years later, however she says back then she hadn’t understood a lot. 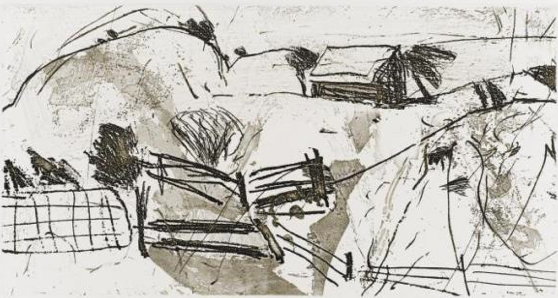 It was with Michael that she started to understand much more about etching: “He was very in tune with what I was trying to do, and then there was the delight of having them (the prints) editioned for me”. For myself, as a student in the Custom Printmaking class, it has been great to witness that the skills we are acquiring really can translate into art that exists in the everyday world, beyond the walls of art school. It’s a wonderful opportunity to see the process from the very beginning, from making decisions about the size of an image, all the way through to editioning and exhibiting. Every step along the way presents its own challenges, which can be daunting (even overwhelming) but with practise become less so. It gives context to the lecturers’ repeated cries during class of wipe your edges clean! Cummings was born in Brisbane in 1934. She studied in Sydney at the National Art School from 1953 to 1957. Her early work, in painting and print, was more abstract than her present practice. The paintings she makes today are imbued with a complexity of colour and such a range of marks that they are at once aloof and inviting; layered, concealed and emotive. I wanted to find out about how the important elements of her painting translate into etchings. However she really enjoys how the result is unlike a painting, which she says is the interesting part. “An etching is an etching, it has quite a different quality to a painting”. With one of her earlier prints, she had planned out very carefully how the plates would go together and she didn’t like the result at all – she had to go back and change each plate to get what she wanted. She likes what happens when she scrapes, and the adding and subtracting on plates which “can make the process very labour intensive”. This is where students, mindful of the opportunity before them and with strong forelimbs, can come in handy. When it comes to colour, it feels like it is both a carefully considered decision as well as an intuitive response in Cummings’ work. “It’s a bit of both. You start the painting and then there is that dialogue with the painting, and what the painting dictates… it’s a process of feeling one’s way” . I wondered how this translates into the process of printmaking, where the physical matrix of the plate holds the composition and mark-making, and colour is only visible when it is printed. “With printmaking, of course, with a three-plate print, the colour is limited. Working out what to do with colour when you’re used to having a huge range, and having to work out how to get what you can out of that limitation is quite a good challenge. But there are ways … of allowing other colour in, doing a la poupee in certain areas – I love to bring in other bits of colour. It enriches things. You might think ‘Oh, I’d love a bit of yellow in this corner, and blue just here, nowhere else on the plane’ which is when Michael will bring in the a la poupee. It’s wonderful, but it makes more work for the printers!” Elisabeth chuckles at this. Some recent prints by Elisabeth Cummings will be shown in an upcoming exhibition of artists who have worked and printed with Cicada Press: “Master Prints” opening 6 December, 6pm, at MLC School, Burwood.